The scene of the Garland, Texas, attack. 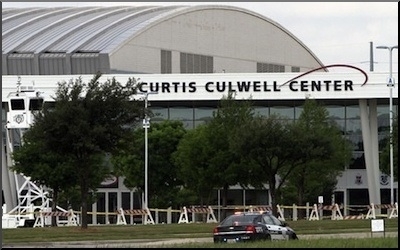 The May 3 assault on a Muhammad cartoon contest in Garland, Texas, prompted much discussion about the assailants' connections to the Islamic State, also known as ISIS, ISIL, and Daesh. Did ISIS run them as agents? Are they part of a new network of terror in the West? Clearly, the Garland jihadis had some connections to ISIS. The leader, Elton Simpson, used Twitter to trade calls for violence with Muhammed Abdullahi Hassan (also known as Mujahid Miski), 25, an ISIS recruiter who grew up in Minneapolis. 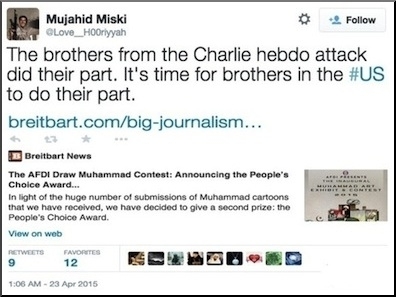 On April 23, Hassan tweeted: "The brothers from the Charlie Hebdo attack did their part. It's time for brothers in the US to do their part," attaching a Breitbart.com story about the Muhammad cartoon contest. The tweet that began the assault that took place ten days later in Garland, Texas. This appears to be what brought the Garland event to Simpson's attention; Simpson retweeted this call to action and responded: "When will they ever learn. They are planning on selecting the best picture drawn of [Muhammad] in Texas." Hassan then further goaded Simpson: "One individual is able to put a whole nation onto its knees." After the Garland attack, ISIS took credit for it, calling the gunmen, Simpson, 30, and Nadir Hamid Soofi, 34, "two soldiers from the soldiers of the caliphate" whose deaths would win them "the highest rank of paradise." Its Bayan Radio exploited the attack to warn Americans that "what is coming will be worse and more bitter," with "soldiers of the Islamic State" doing "terrible things." But, so far as is known, neither Simpson nor Soofi took money from ISIS, received arms or training from it, discussed their plans with it, or sought its permission to proceed. Nor did either of them visit Syria or Iraq. Elton Simpson pledged allegiance to the leader of ISIS. This fits a pattern: ISIS does not plan and direct attacks but takes advantage of its high profile to incite Muslims to turn against their non-Muslim neighbors, as happened already in Oklahoma City. It offers spiritual guidance, target selection, and inspiration; it is not in the business of logistics, command, and control. When it claims credit, it claims so for inspiration, not organization. Therefore, one can probably dismiss as braggadocio ISIS' boast to have trained 71 soldiers in 15 of the U.S. states who are "ready at our word to attack any target we have desired," much less the 23 of them have volunteered for "missions like" the Garland attack. But U.S. law enforcement does follow thousands of individuals like Simpson and Soofi who communicate with ISIS and could at any time erupt into to violence. The years-long surveillance of Simpson, after all, proved useless. The "lone wolf" concept has become irrelevant at a time of global jihad, when every pious Muslim is potentially a "soldier of the caliphate." Unlike Al-Qaeda (whose model we are more familiar with), which communicates intensely with its agents and directs their moves in detail, ISIS is not primarily in the business of organizing elaborate plots to strike Western infidels. Rather, it aims to control territory in the Middle East (such as in Libya, Yemen, Syria, and Iraq). It calls Western Muslims to move to Syria; attacks in the West are only a fallback, primarily promoted by smuggling its members across the Mediterranean to Europe. Inspirational links are more worrisome than organizational links. Nonetheless, the ISIS model is the more dangerous. Its attacks may be amateurish and less deadly than Al-Qaeda's but they potentially can occur far more often. Its assaults are easier to foil but harder to anticipate. The ISIS approach is the more effective if one counts not corpses but political impact – for example, dissuasion from ridiculing Muhammad. In other words, inspirational links are more worrisome than organizational ones. All ISIS needs do is publish a target's name in its magazine or tweet encouragement on social media and a potential army is notified; it need not develop secure communications, train cadres, move money across borders, choose and scope out targets, order strikes, and give tactical directions. A BBC analysis misses the point when it holds that if ISIS can "prove that it planned and directed [the Garland attack] – rather than just staking a claim after the event – then that would be a significant development." Not so; ISIS is all the more formidable for not planning and directing but simply talking and writing. Indeed, just as the Iranian regime presents the greatest danger to the Middle East, ISIS presents the next, more evolved, and most threatening form of Islamist violence in the West. Will these mortal enemies be recognized in time? Related Topics: Counter-terrorism, Muslims in the United States, Terrorism | Daniel Pipes receive the latest by email: subscribe to the free mef mailing list This text may be reposted or forwarded so long as it is presented as an integral whole with complete and accurate information provided about its author, date, place of publication, and original URL.